Bilevel optimization is a challenging class of problems, with applicability in several domains such as transportation, economics and engineering. In a bilevel problem, the aim is to identify the optimum solution(s) of an upper level (“leader”) problem, subject to optimality of a corresponding lower level (“follower”) problem. Most of the studies reported in the literature have focussed on single-objective bilevel problems, wherein both the levels contain only one objective. 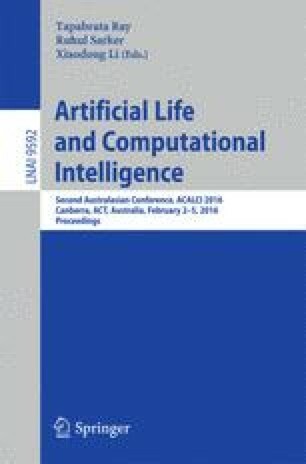 Several nested algorithms have been proposed in the literature to solve single objective problems, which have been subsequently enhanced through hybridization with local search in order to improve computational efficiency. The handful of algorithms used for multi-objective algorithms so far have used additional enhancements such as use of scalarization, sub-populations or hybridization. However, interestingly, unlike single-objective problems, the performance of a simple nested evolutionary algorithm has not been reported for multi-objective bilevel problems. In this paper, we attempt to address this gap by designing an algorithm which uses differential evolution at both levels. Numerical experiments show that on popular benchmarks, the proposed algorithm exhibits competitive performance with respect to existing state-of-the-art methods. The third author acknowledges support from Australian Research Council Future Fellowship.